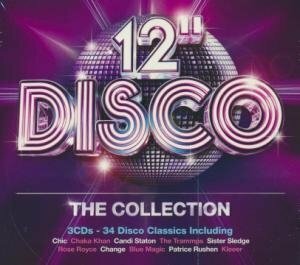 Titre(s) 12'' disco : Collection (The) / Chic / Chaka Khan / Candi Staton...[et al.]. Editeur(s) Paris : Warner Music, 2013. Contient Freak (Le) / Chic. - I'm every woman / Chaka Khan. - Young hearts run free / Candi Staton. - Disco inferno / Trammps (The). - Is it love you're after / Rose Royce. - Space age / Jimmy Castor Bunch. - Do what you wanna do / T-Connection. - Sorcerer / Norma Jean Wright. - Jump to the beat / Stacy Lattisaw. - Working my way back to your ; Forgive me girl / Spinners. - I shoulda loved ya / Narada Michael Walden. - Here comes that sound again / Love de Luxe. - Rock your baby / George McCrae. - Supernatural thing : parts 1 and 2 / Ben E. King. - Hi-Jack / Herbie Mann. - Welcome to the club / Blue Magic. - Why leave us alone / Five Special. - When you wake up tomorrow / Candi Staton. - Just a touch of love / Slave. - Welcome to our world / Mass Production. - You're a star / Aquarian Dream. - Clouds / Chaka Khan. - Searching / Change. - He's the greatest dancer / Sister Sledge. - A lover's holiday / Change. - Whistle bump / Eumir Deodato. - Wear it out / Stargard. - You're lying / Linx. - Time / Light of The World. - Look up / Patrice Rushen. - Starbooty / Ubiquity. - Keep your brody workin' / Kleeer. - Dancer / Gino Soccio. - Weekend / Phreek.